Within minutes of getting my hands on Bastion – the first game from acclaimed developer Supergiant Games – I knew I was about to experience something special. Whether this was down to its visually striking art style, the air of mystery surrounding the story or the inviting voice of the game’s narrator I found myself hooked. Details are kept scarce in the early goings even the main character’s name shrouded in secrecy – the narrator refers to him only as ‘the kid’ and nothing more. What little the game does reveal is certainly enough to hook and reel you in though. Your adventure picks up in the aftermath of the Calamity, an event that has fractured the city of Caelondia and turned many of its inhabitants to dust. It’s a haunting situation and one that’s slowly made more sense of thanks to the fantastic narrator, a voice that will literally narrate your travels as you’re playing whether it’s explaining where you are or even if you happen to simply detour from the main path to destroy some crates. Played from an isometric stance, this action RPG isn’t overly complex to learn but kept engaging thanks to the constant desire to explore your surroundings and of course the pleasing combat. The way the world reveals itself floating piece by floating piece as you approach its edge is a visually neat trick and one that never lost its appeal. It left me constantly wondering what hidden secrets await with each new section that would appear or what enemies might need to be taken down. With uncharted territories come unfriendly foes though and combat is what you’ll find yourself doing a lot in the game. Fortunately, there’s a good amount of variety in the enemies you’ll face as well as the tools at your disposal. The kid is fairly quick on his feet able to roll out of harm’s way and equip two weapons and a special ability. Whether you’re opting for the ranged attacks of the Fang Repeater or want to get up close and personal using the fast machete-like War Machine, each item in your arsenal feels satisfying to yield and very different to actually use. I found myself rarely sticking to a single load-out, constantly experimenting with different combinations, some essentially changing the way I battled altogether. Of course, not every selection resulted in the most efficient fighter but it certainly proved interesting to try and figure what worked best for me. As your enemies grow in power and challenge you too will have the chance to upgrade. Gathered cores are used to build workshops within the Bastion, each offering its own perks. Materials and fragments can be cashed in to improve your weapons in the Forge while experience will gradually level your character up offering the chance to equip more ability awarding spirits in the Distillery. As elementary as the RPG elements are in the game they do offer a nice sense of progression and make you feel like you’re always working toward some sort of perk or reward. Visually Bastion is a stunner, it’s almost watercolour-esque storybook presentation drawing me in from the very opening moments. As I mentioned before, the way the world reveals itself to you as you literally step toward it is a brilliant touch. The game impresses when playing in docked mode but looks even better on the smaller screen of the Switch. Bastion feels so perfectly suited to the portable nature of the device, the bite-sized levels ideal for filling some time on a commute to work. That being said whatever way you play, there’s nothing to really complain about in terms of performance. From an audio standpoint, the game is no slouch either, the music impactful and complimented by the great voice work of the narrator. In fact, it’s the way the game blends all these elements together that truly impresses, the game’s presentation leaving a lasting impression on me even past its closing credits. 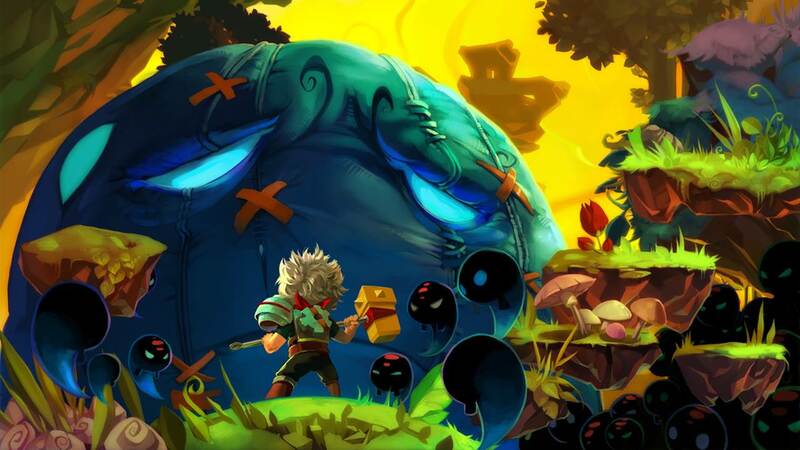 It’s great to finally see Supergiant Games bring some of their great work over to a Nintendo platform and Bastion easily ranks among the best. From its eye-catching presentation to the mysterious story to the challenging but satisfying combat Bastion is an emotionally fascinating journey from start to finish and one well worth venturing.